On Sunday I talked about how much I love being right. And if you love being right as much as me, you also know how much fun it is to tell everyone else how right you are. But I’ve come to realize recently just how hurtful those words can be. In fact, I think they may be some of the more selfish words that we can utter. Phillipians 2:3-4 Do nothing from selfish ambition or conceit, but in humility count others more significant than yourselves. Let each of you look not only to his own interests, but also to the interests of others. And this is what I realized. There’s not much, if anything, that I can say that can show that I’m looking to my own interests than when I say “I told you so”. Take a typical date night with your spouse for example. You say….We better leave at 6 to beat traffic, we should take this route to get there quicker, that restaurant will be too crowded tonight. And let’s just suppose that your advice is ignored….. As you’re arriving late from the wrong route at a restaurant that’s too crowded–Don’t you think your spouse already knows that they’re wrong? Of course they do. You know it and they know it, so what good does it do to say it? The idea of seasoning your speech with salt is the idea of preparing your conversation with the same care that you would prepare a meal. The words that I’m putting together and sending out are going to be taken in by someone else, likely someone who I love. So should I prepare those words to satisfy my own ego and soothe my own frustrations? Or should I prepare those words to nourish them? 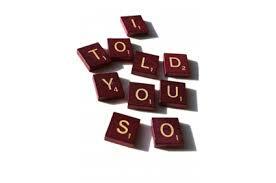 Nothing about “I told you so” nourishes the person you’re talking to. Those words are spoken entirely for the benefit of the speaker. Now there’s nothing wrong with good natured ribbing and making a joke that the recipient of your words finds funny. Megan even has a cute little “I toldja so” jig that she does. And it’s funny, because it’s all in good fun. But in the context of satiating my own desire to be right and make sure everyone else knows how right I was, I’ve decided to eliminate “I told you so” from my vocabulary. If you try to eliminate “I told you so” from your vocabulary and it goes well let me know…..(I’ll tell you all about how I knew it would work). ← Why aren’t our kids being baptized?